Sign up for FREE Membership. At any moment we have 35% Case Study Solutions absolutely FREE !! Every week we shuffle and make "another batch" of 35% case study solutions FREE. So, if a solution is currently a premium paper, then it may become a FREE paper next week. Keep visiting this website or our Facebook page to keep yourself updated regarding the date and time of the next shuffle. 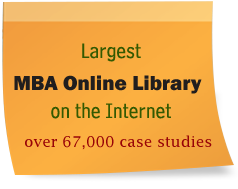 Premium users have instant access to the entire library of over 67,000 Case Study Solutions.